Lately, I've been making a big pot of soup on Monday. I've found it really helps me eat healthily throughout the week. Soups are also super cheap, easy to make and meat-free (perfect for meatless Monday). I couldn't believe my eyes (mouth?) when I made this simple soup and it worked a treat! And it's so cheap too. I used the McKenzies Superblend Protein mix. It's got quinoa, French Style lentils, red lentils and beans in it. If you can't find the mix, just use 350g of quinoa, lentils and beans and you'll get a similar effect. Just cook until all the beans are soft. 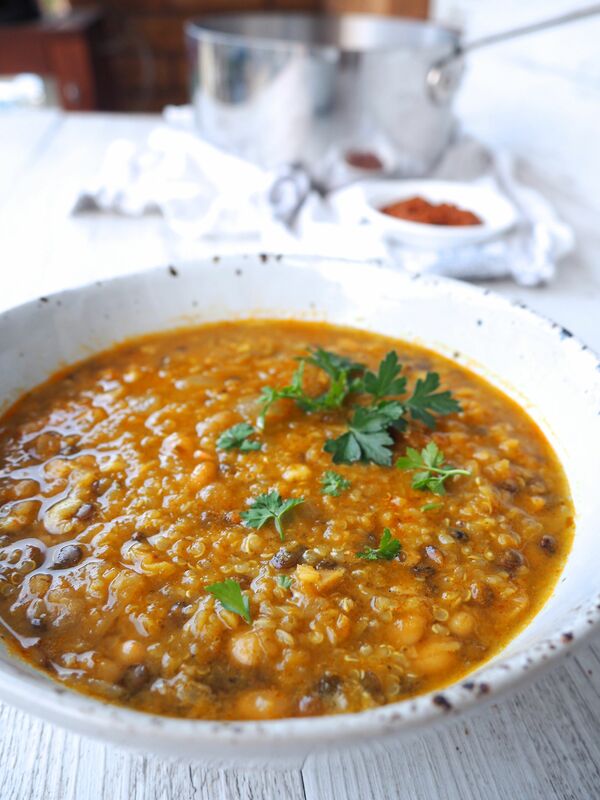 Thanks for the blend of beans, lentils and quinoa, this soup is super high in fibre, a great source of plant-based protein and so you're going to notice it fills you up and keep you regular. With just one pot and few ingredients, you'll have a delicious mid-week dinner option. It makes six big bowls but you can always double the recipe so you have plenty to freeze and enjoy throughout the week. Add more water or stock if you like a broth-ier style soup. Serve with parsley if you have! And if you like it hot, a few chilli flakes on top works a treat. When you need a healthy and VERY easy dinner, this is the recipe to choose. One pot and just a few key ingredients will create a delicious meal. To save me time (and tears), I put my onion and garlic in the food processor instead of chopping it. If you can't find the McKenzie's Protein blend, just use a mix of dried quinoa, lentils, and beans, equivalent to 350g/9oz. 1. Add oil to a large soup pot. Once hot, add onion and garlic. Brown for 5 minutes. 2. Add dried beans/quinoa/lentils and 'toast' for 2-3 minutes. Add stock and red curry paste.3. Cook for 20-30 minutes. Add more water if it gets too thick. Serve with fresh herbs like parsley (optional). Disclaimer: This post isn't sponsored by McKenzies. I just love this product.